The Big E Walk-in Tub is the largest tub of its kind, manufactured by American Manufacturer Best Bath Systems. The Big E is available with a water jet package, an air jet package, or both jetting systems for the ultimate bathing experiance. These units come with a safety bar, special drain waste and overflow. Water Usage: 170 gallons Dimensions: Basic tub 39" H x 60" W x 35" D. Basic tub with wall surround 99" H x 60" W x 35 D". Available with door on right or left side. 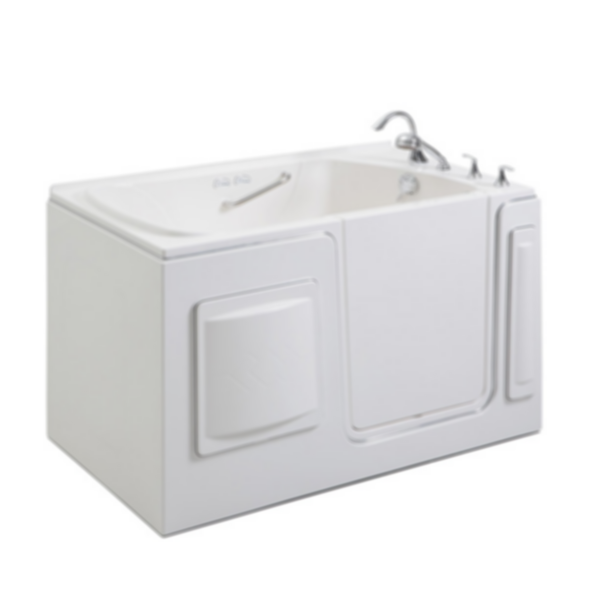 W*D*H: 60" x 35" x 40"
Since 1971, Best Bath Systems has been dedicated to designing and manufacturing bathroom products that are safe for people of all abilities. Today, we are a leading American manufacturer of walk in showers and bathtubs for residential and commercial remodels and new construction. The company was founded by current CEO Gary Multanen. When his mother was not able to use her bathtub any longer, he realized what a great need there is for safe, accessible bathing units. When you choose a Best Bath product, you choose the most innovative and best constructed bathing solutions on the market today. Our products are designed for trouble-free installation, lasting durability, and beauty to suit your decor.